We have a tradition of celebrating Day of the Dead in our family and when The Book of Life came out we fell in love with the movie. SInce our boys were little we have enjoyed choosing a theme to suite our whole family. We talk about it and choose together. Both my sons love the The Book ofLife so we went with it. My youngest has CP so we always take that into account. We always incorporate his wheelchair into his costume. This year he was Joaquin and his wheelchair was his horse. 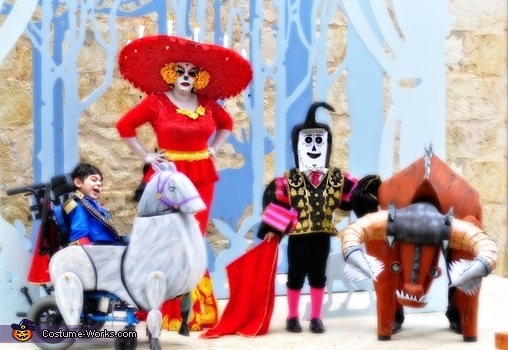 My oldest was Manolo , my wife was La Muerte and I (Dad) was Asesino the bull that is spared. Everything was homemade. We started with my sons chair. Found a picture of the horse in the movie printed out on a transperancy and over layed on my sons chair to get the right proportion. Cutout a cardboard template then cut out all those pieces out of 2 inch foam. We painted and textured the foam to give it a wood feel and mounted it on a cardboard structure we had made that was wrapped around the chair. Grandma made the Blue coat he wore and we made all the accent pieces from craft foam. Manolo's head was made from a small trash bin and the hair was carved out of 2 inch foam and attached to the top of the can. We used LED Tea light candles for the eyes. The main body for Manolo was from 1/4 foam that was cut and glued to give it the boxy look. All the accessories on this piece were craft foam. La Muerte's hat was made out of cardboard over layed on top of a smaller hat. We covered the hat with red velvet scraps the dress. Made some candles out of parer and hot glued to the rim of the hat all the way around. Grandma sewed the dress and we added paper flowers to the dress. We took a plain white mask and hand painted The Muertes face onto that to avoid having to redo the makeup every time the costume was worn. I have always wanted to make a costume that would have me on all fours to change the perspective of it. Started with the head first. Took an old bicycle helmet and used it as a base. Built up the base from card board. Made 2 large horns by rolling up some cardboard and extending it out. Added details with foam. The body was all foam from yoga mats. Took a soldering iron to create details on the body to make it look like wood. Amazing work- the details are flawless and the result is beautiful! I hope you win!